I'm having a problem with the official "Array Delete At" action, the array and the index are correct and the index is not out of range. Yet the item at the specified index is not deleted. Can the official action be update with the following line to make it function please? VR Help / [SOLVED] SteamVR Action Stack Overflow? On the "Send Event" and "Send Event By Name" actions would it be possible to add the option to choose the event target "Fsm Component" to send the event to? Instead of only being able to drag an drop the Fsm Component. I've found that the "Get Fsm Bool" and most of the other "Get Fsm Actions" are missing a small section of code that allows the user to loop through Fsm components on the same object. This is fix is already implemented in most of the "Set Fsm Actions" it would seem. At present it's set up so that only the value of the first Fsm found on the gameobject is retrieved. I've fixed it on my end by changing the following. I thought i'd just post this in case any other people run into this problem. Playmaker Help / Running update and fixed update in one state? Hey guys i read somewhere that it's not recommended to run actions that utilize update and fixed update in the same state. I'm running a "Ease Float" and a "Set Velocity" in the same state, would this be a problem? I'm having some performance problems when using the Run FSM action as part of my VR system to interact with objects. After using Run FSM/Finish FSM about a 100 times my game starts to stutter and becomes unplayable. This does not happen when i remove the Run FSM actions and replace the templates with normal Fsm's. This feels like a garbage collection problem of some sorts, are the template Fsm's actually being unloaded from memory when running Finish Fsm? Something like this only with a Quaternion as input and everyframe/updatetype. Hey guys, i'm working on a "Slider-Crank" mechanism and having some trouble. 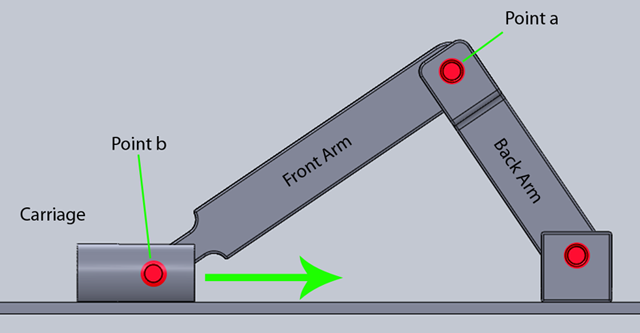 I move the "Back Arm" and the entire setup moves with it, however i cant seem to get the "Front Arm" to rotate as if it had two fixed points of rotation "Points a/b"
Both arms rotate offcourse and the carriage move on the z axis only. So basically i need a rotation between two objects. I tried every action i could think of but nothing gives a perfect result. Hey guys i've got a projectile with a rigidbody that i'm propelling with AddForce and i need the movement to be independent of the framerate. Hey guys i was just wondering if there was any real performance difference between the "Find Child" and "Get Child" actions? I'm changing up my naming conventions and was wondering if i could switch to "Find Child" without seeing a drop in performance. I would like to request a "Get Parent" action that allows me to not only get the parent of my game object but also allows me to define how far up the hierarchy chain i want to pick a parent. Get parent three times removed or something. I have a game object that needs to be parented and unparented a lot and i want to be able to always choose the third parent up as my root object, without having to use 3 or more "Get Parent" actions. "Get Root" is useless in this situation. Hey guys, i find myself in need of a script to compare an array index to about 10 other ints(options) and if i get a match set an object value to the object value specified on each of the 10 ints and then fire off a finish event. Could anybody give me some hints on how to actually set the object value in this script. I could offcourse just use a Int Switch with 10 transitions, but that would be a lot of extra states. Hey guys, so i'm workig on a AI system for my game and i'm trying to figure out the best way to check if other NPC's are within a certain field of view. Tracking one object is simple offcourse, however i need to check the angle/visibility of multiple objects from an array list to see if they move in/out of the FOV. This array list is populated with objects that are in close proximity to the NPC doing the checking, so this list changes depending on the objects in range. So i never know how many items are in the array at any given time. Hey guys, is it currently possible to find out which specific action in a state was the one that triggered a transition event? I have one state that checks if a whole list of variables has changed and if any of them change i want to fire off the FINISHED event, however in the next state i need to know which specific action triggered the event so that i can know which variable i need to change.